The Mountaineer Scouts helped out this weekend with the Fraser Valley Council’s “Winter Scouting Skills” course for Scout leaders. Special thanks to Scouter Tim Driscoll (FVC DCC-Scoutcraft) for organizing the event and letting us take the group up into our playground! “Now I lay me down to sleep…” The stars really came out for us on Friday night! This is the first time these Scout leaders ever made breakfast in a kitchen that they carved themselves from snow (with help from the Mountaineer Scouts). Sorting out their campsite Saturday morning. The whole team ready to snowshoe up into the mountains on Saturday. The goal was the lake directly below the glacier seen in the far center of this photo – a 5 km. hike with a 1,200 ft. elevation gain (mostly in the final 2 kms.). Three members turned around at about the 1/4 mark. Before they returned to base, we had a little avalanche discussion on an open 32 degree snowfield. The members that carried on had the right mountain climbing snowshoes to get themselves up some fairly steep slopes (and, more importantly, to be able walk straight down those slopes without sustaining a serious fall). From left to right: Mountaineer Scout Tavish, Scouter Jason, Mountaineer Scout Simon, Scouters Charles and Jamie, Event Leader Tim Driscoll and Scouters Suzey and Dennis. Time to make some tracks! Mountaineer Scouts Tavish and Simon lead an extremely able Scouter Dennis up the mountain. Always looking to the next adventure! Careful crossing. One at a time. Scouter Dennis. 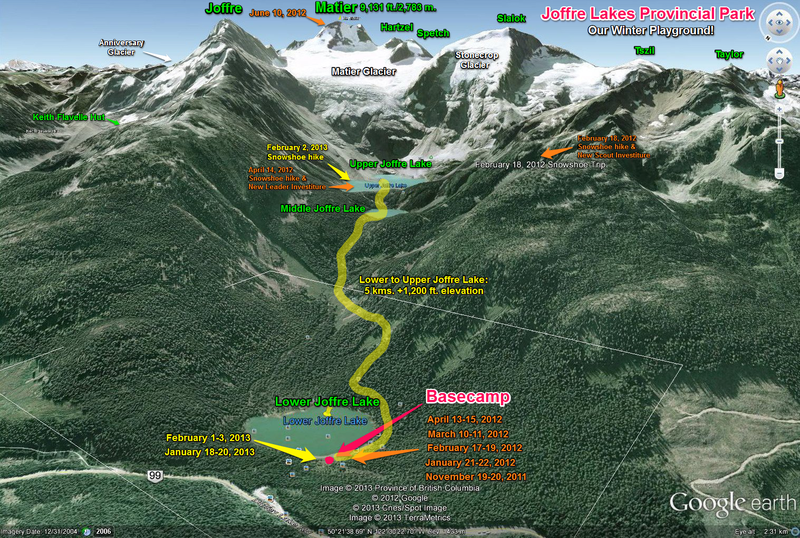 Middle Joffre Lake. Scouters Charles, Jason and Dennis managed to get all the way to Upper Joffre Lake (5,131 ft./1,564 m.) under the Matier Glacier. Well done guys! Strike a pose. Making Zoolander proud! The day’s getting late and a harsh wind is starting to kick up…. Time for one last picture before heading back down to our camp in the lower valley. The Upper Joffre Lake cathedral. We had a late start to the day and planned to return after the sun had gone down (which happens pretty quick in the mountains). It was pretty cool seeing the team’s headlamps bobbing along in the snow in the darkness stretched out over about a 1/8 of a mile below me as we descended through the forest and traversed large open snowfields during our 5 km. hike back to camp. Apparently the group at basecamp could see our headlamps coming down the mountain from quite a distance. Another fantastic campfire with good company under a starry mountain sky. On Sunday morning we buried some avalanche beacons and taught the Scouters how to find them with a third beacon. As the Mountaineer Scouts would say: “Welcome to the High Life!” to all that attended the camp. I’m pretty sure that at least two of the Scouters are hooked and looking forward to doing this again real soon.Unfortunately, four other Scouters that had signed up for the camp had to drop out due to conflicts in their regular lives. See you all in the mountains!